1. In a pressure cooker, heat oil. Add cumin seeds and peppercorns. As they splutter, add finely chopped ginger, curry leaves and green chilly (cut in half). Fry for 30 secs. 2. Add 4 cups of water and add the required salt along with asafoetida. Let the water come to a boil. Add the moong dal + rava mixture into the boiling water. 3. Reduce the flame to medium and cook the Rava Pongal for 3 whistles. Let the pressure drop before opening the cooker lid. Mix well. 4. Serve hot with a dollop of ghee on top and with coconut chutney or sambar on the side. 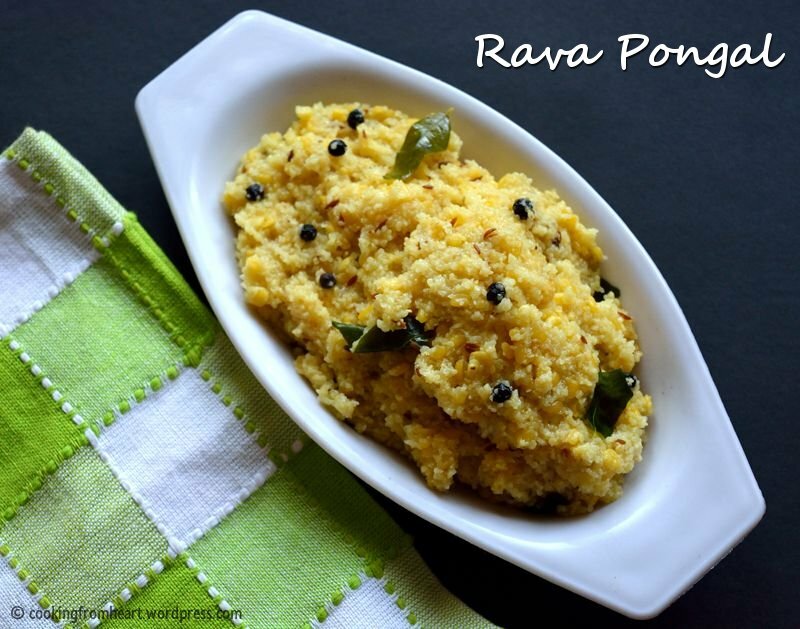 I did not roast the rava before making the pongal as the pongal has to be a bit mushy. Ginger and green chilli are optional especially if serving to kids. I used 3 cups of water for my pongal and felt that the moong dal was a wee bit undercooked. Either add 3 cups of water and cook for one extra whistle or add 4 cups of water. Ghee on top is optional but enhances the taste. Serve hot and when the pongal is cooled down, it hardens. This is a really different recipe for breakfast and it sounds delicious!